This is the chain that I bought on the recommendation of M.C. : A KMC MZ9000 ordered from jensonusa.com, and as you can see it comes with a quick link connector which makes the installation easy. So I put the mountain bike on the Park Tool CS-9 workstand and put the chain on. It took only a few minutes and I was happy to be faced with a step that would be so easy and produce a big result. I threaded the chain all the way through and snapped on the quick release connector before taking a step back to admire my work look at what I had done. I was puzzled. It didn't occur to me the chain would be too long, but here it was. I've been used to chains being too short. 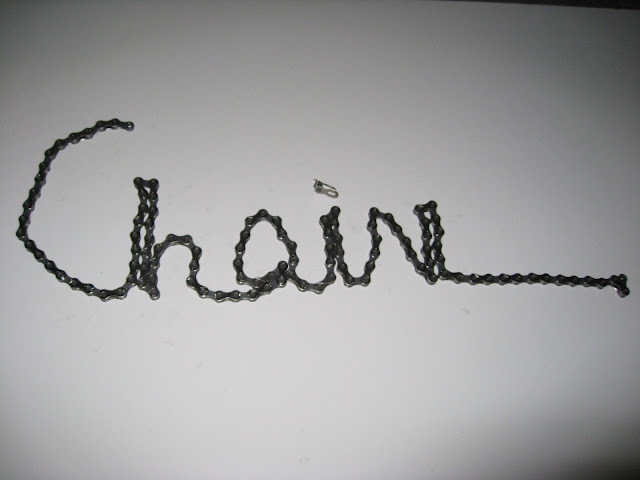 When I had to replace the chain on the recumbent, I bought three generic bike chains and spliced them all together to make it the right length. Building a new bike from scratch, I was a bit off. Then I realized I had no idea of what position the front derailleur should be in for this, and if there was some Magic Link Number I wasn't aware of. The frame didn't come with instructions. The crankset didn't have them, either. Time for some guesswork. First, I had to undo the quick link. As the name implies, it is in fact 'quick link' not 'quick unlink' so I struggled desperately with it to no avail. I finally had to use my Park CT-5 mini chain tool and I took out a hunk of chain that had the quick link still in it. My stupidity was minimized by the fact I was still having fun. I also had an extra quick link in one of my 304 drawers. 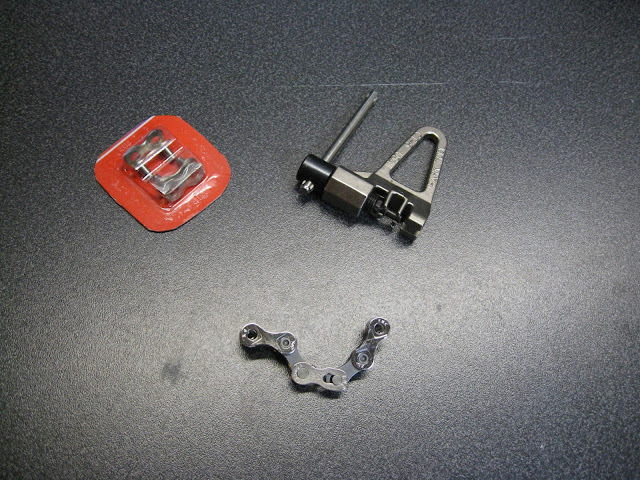 When I attached it to the chain, the derailleur pulled it tight, so it looked about right. Tentatively, I pushed down on the pedal. The bike sprung into life. 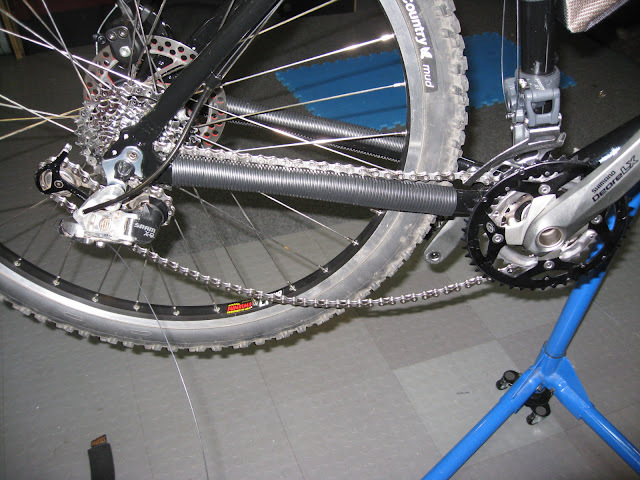 The chain clattered against the cassette and the improperly-placed front derailleur, but it was actually moving. When I tried the shifters, which were still on the stand-in handlebars I had gotten from M.C., the chain moved shockingly easily from one ring to another, but it still clattered and rattled against the front derailler. It was still progress. Meanwhile, my replacement handlebars and stem, which were the only parts I was waiting for at that point, still hadn't arrived, but I then realized that when I'd tear into that package, I'd at that point be hours from a mountain bike I put together myself. In anticipation of the first ride, I pedaled the Dahon Matrix six miles north to the Mianus River Park, which is hundreds of acres of land on the Greenwich/Stamford border. At the parking lot I saw a few cars with empty bike racks on it. Good sign. I didn't ride the dirt roads far since the Matrix had such skinny tires, but it looked like a fun place to take the first ride. There was a little mud here and there, which made me remember how filthy M.C. and I looked when we rode together in Wallingford. I took the long way back and pedaled to Greenwich Bicycles. Even though they had just moved into their new location on 35 Amogerone Crossway and were still getting set up, I found a Topeak Defender Rear Fender on the shelf, paid for it, and it stuck out of my saddlebag on the return ride to Stamford. Even though I learned later the fender didn't get the best reviews, I was determined to stay clean(er) on my soon-to-be-finished mountain bike...and extend the build time, even if only by a few minutes.